IMPOSSIBLE HORROR BLU-RAY RELEASE SCREENING + PARTY! It’s finally here after much anticipation! IMPOSSIBLE HORROR will be screening on Tuesday, October 23 at 7:30 p.m. at The Royal Cinema – Toronto in Little Italy! 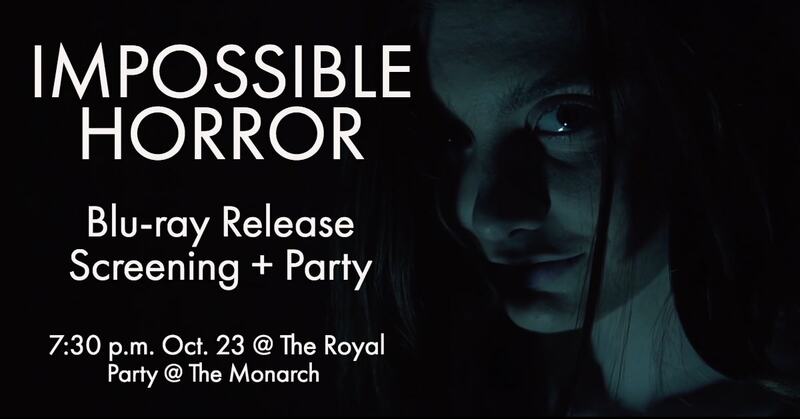 We’re extremely excited to be releasing Impossible Horror on Blu-ray at The Royal (which is featured in the film) and we hope you can make it out! General tickets on sale now for $12! There is also an option to get a ticket and pre-order your Blu-ray to pick it up at the screening for $27! We’ll be heading over to the upstairs at Monarch Tavern after the screening for a few drinks to celebrate! Hang out and have a super fun party time! CW: This film contains graphic violence and instances of self-harm. In Impossible Horror, Lily (Haley Walker), an insomniac filmmaker who is facing a crippling creative block, begins to hear a sinister scream outside her window every night. Convinced that she must find a way to help the person that is screaming, Lily heads into the darkness of her neighbourhood and meets Hannah (Creedance Wright), a veteran scream hunter, obsessed with putting a stop to the nightly occurrence. The women join forces to solve the bloodcurdling mystery and quickly discover that its true source may be an otherworldly threat that is driving its victims into madness – and Lily and Hannah are next.